I have this data and i need to calculate RoI for it. But i'm new to this and i don't know how exactly should i do this. 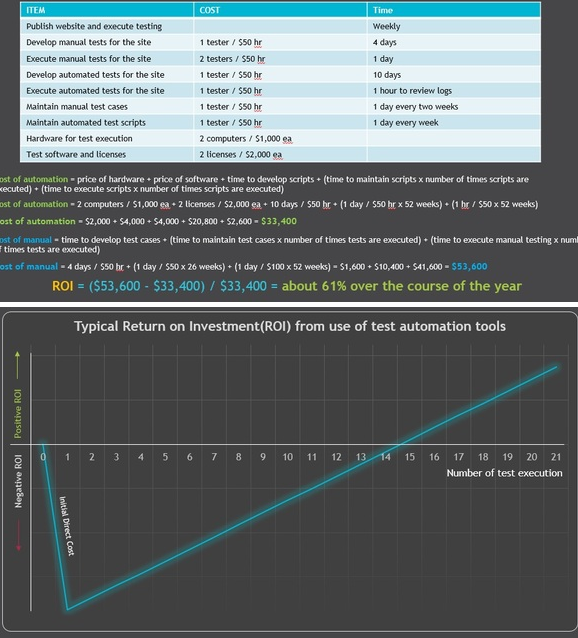 Should i calculate it for every day or just total cost of (manual test - automated test) / automated test (something wrong with the answer if i do it this way? Or do i need to calculate RoI for equal tasks like development of tests, executing and maintaining? Answer is in the second picture. Not the answer you're looking for? Browse other questions tagged testing automated-tests integration-testing roi or ask your own question. Framework for automatically planning execution order of automated regression-tests? How do continuous integration and automated tests look in practice? Qt Auto-UI Testing stopping because of messagebox. How to simulate enter on messagebox? What level of detail is required in gherkin formatted test scenarios to support automated testing? Testing with manual calculation or programmed calculation?